12mm thick tongue and groove walls, 4’ x 4’ lookout playhouse, this wooden building is a great addition to have in your garden ensuring your children house of fun; this product is sturdy and long-lasting with a smooth finish. 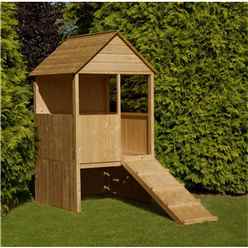 The 4ft x 4ft Wooden Lookout Playhouse is ideal for entertaining your kids without breaking the bank. 12mm Tongue and Groove Shiplap Cladding makes the playhouse sturdy and less prone to being damaged.